It’s always a delight when the landscaping is finished as soon as the inhabitants move into the house and the design of the garden rhymes with that of the house. In this this newly constructed home in one of Reykjaviks satellite towns, the main aim was to create an outdoor extension of the inside space, thus creating outdoor living areas rather than a yard with a detached feeling. With over a 3 meter drop from the yard next door, retaining walls where a necessity but by having 2 levels with planters in between the height becames less obvious. The main elements are fixed benches by the walls, a hot tub surrounded by a glass fence, a large deck for entertaining, a spacious storage unit and a lowered area for play. This area was filled by a trampoline when the pictures were taken. Creating a space that looked inviting from the interior was a main concern and the whole back yard is easily visible from both floors. The white concrete retaining walls give an impression of the house extending out into the landscape. 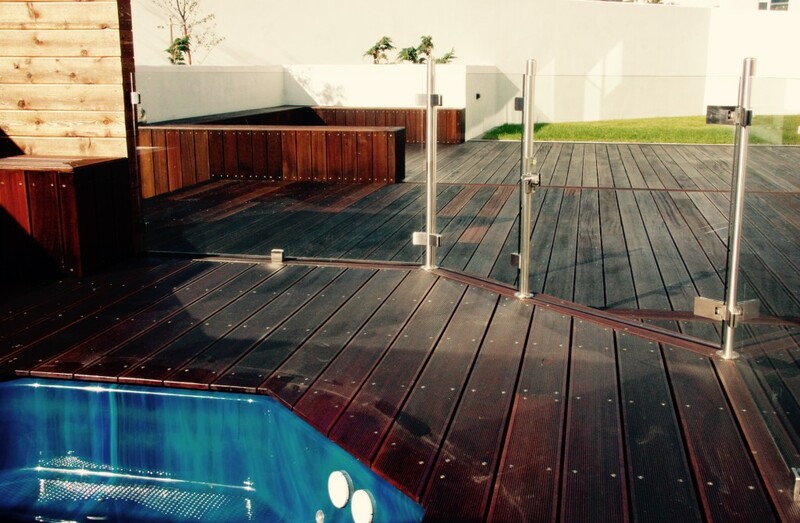 One of the most prominent features of the back yard is a hot tub fenced in by a glass railing. By fencing the hut tub area off with a lockable fence the worry of wandering unsupervised children by the tub is none at all. The tub is sunken into the deck, with the boards of the decking extending over the edge of the tub to make feet dangling whilst sitting on the edge more comfortable. For those who love precise details notice the straight lines of the screws in the decking and how the decking is extended up the wall in the form of a fixed bench. Fixed furniture lends a look of completeness to a deck and for informal seating this bench is a must have. It also connects the white wall with the decking, merging them rather then creating a clean break. By the front door the area is covered with cut concrete and a small retaining wall, which creates space for buggies and bicycles. 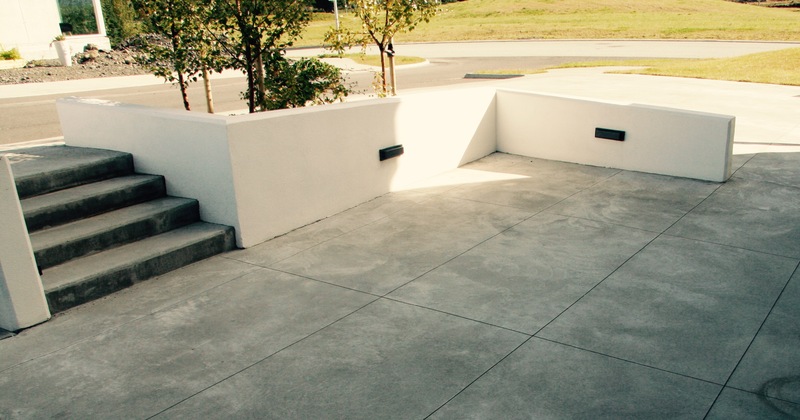 The even finish of the concrete surface is the modern touch that completes this space. 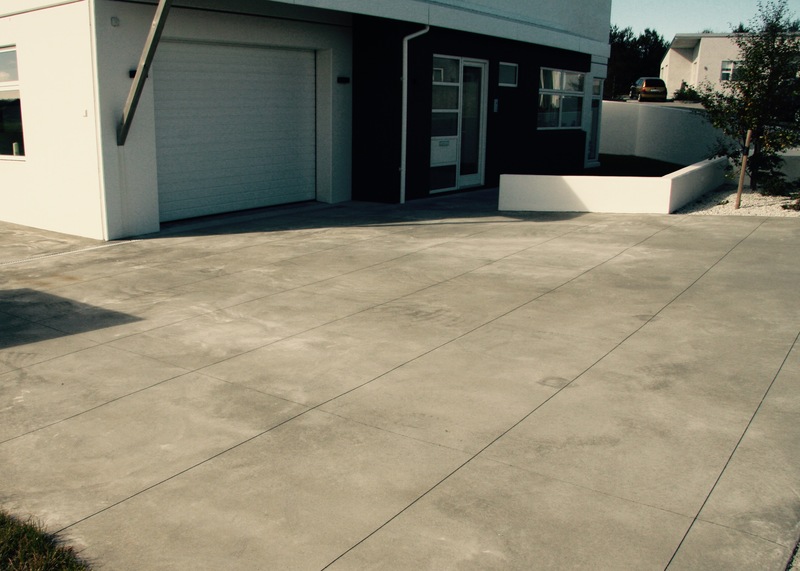 The driveway is covered with the same concrete finish with expansion lines creating a pattern relating to the lines and forms of the house. in a polished finish with cut lines to create a texture. 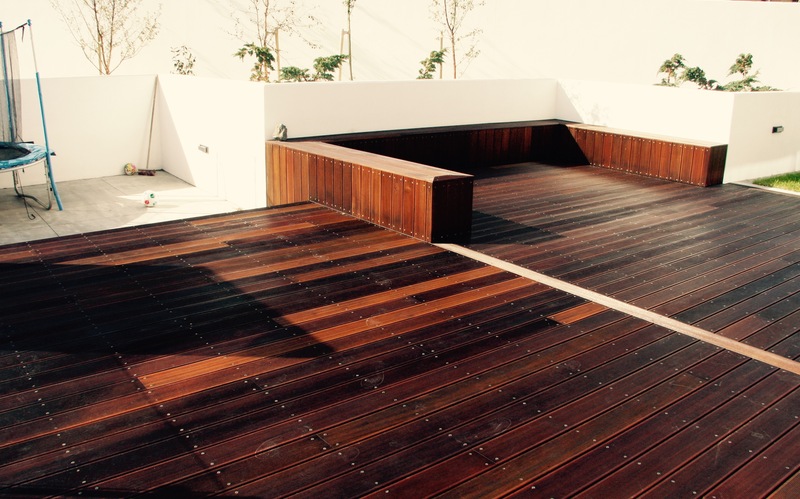 For home owners looking for stylish functionality this is a landscape to be inspired by.